The only things I know about Cajun food is that it originates from Louisiana, uses seafood and should be spicy. I’ve never had anything near authentic Cajun food before so I’m not going to claim I know what’s good Cajun food. But, I do know what good food is in general, and can say without a doubt that the food at Liliana’s was fantastic! I looked at the menu a couple times the day before and still hadn’t decided what to get when I got there. The menu is an interesting mix of Cajun recipes, traditional restaurant offerings and a couple Wisconsin favorites. I knew I wanted to go the Cajun route but couldn’t decide what dish I wanted to try more. After rereading the menu multiple times I decided on the Jambalaya…probably the most Cajun dish I can think of! While we were still deciding on what to get the waitress brought over a plate of cornbread. 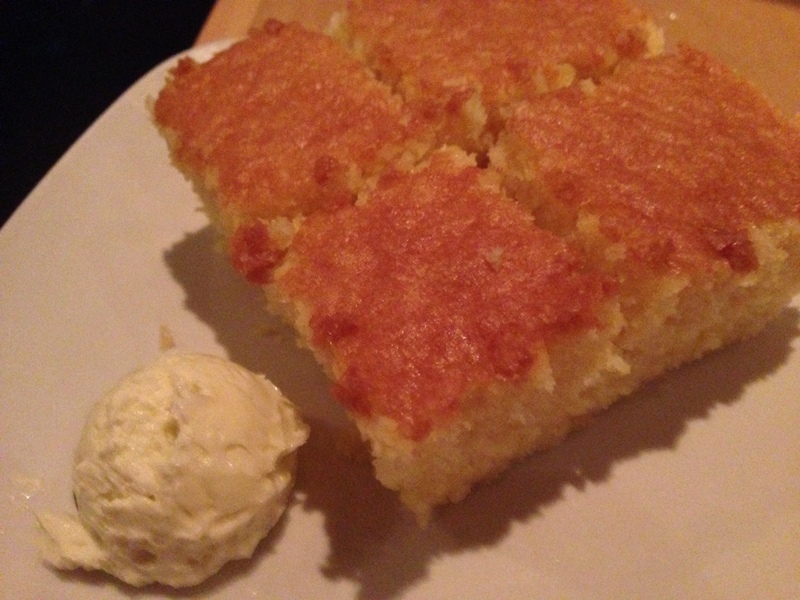 I don’t eat cornbread very often because it’s not readily available but I absolutely love it! We ate two plates of it with the super good whipped jalapeno butter. The jalapenos were at the bottom so you could get regular butter or spicy butter based on what your preference is. The cornbread was perfectly moist and sweet, a perfect compliment to the rich, spicy Cajun food. My friend got the red beans which came in the same large serving and had vegan sausage in it. It was pretty good but the sweetness of the dish was a little unexpected. I think both of us were expecting a hearty, spicy flavor. The consistency was also interesting. The beans were cooked down to mush so there wasn’t much texture. My large bowl of jambalaya came out smelling like wonderful spices and smokiness. I’m not the biggest fan of rice so I was pretty happy with the limited amount of it in the bowl. 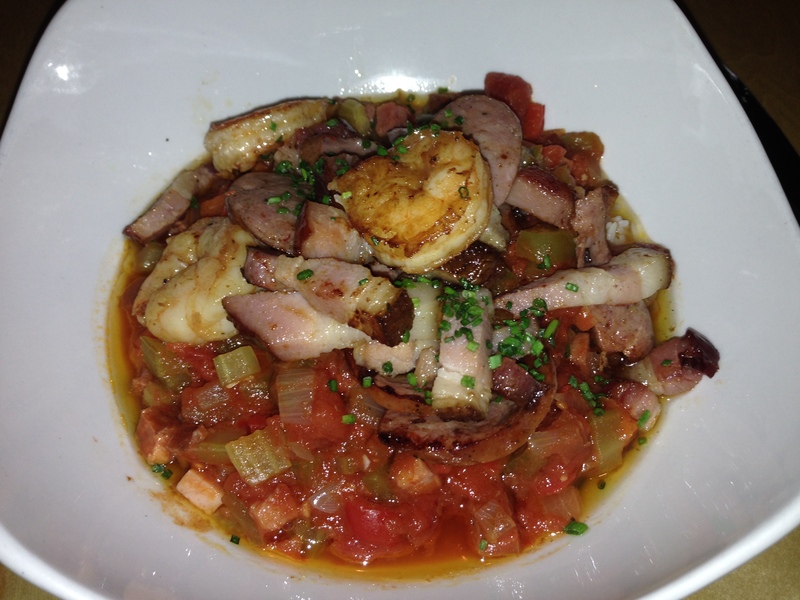 The four large shrimp were perfectly cooked, and the rest of the dish was a prefect combination of tomatoes, peppers, onions, ham, bacon strips and sausage. I loved that the sauce wasn’t too heavy and didn’t overpower any of the other ingredients. It wasn’t too spicy but had a super good flavor with a ton of depth! The dessert menu had a couple regular restaurant options, bourbon pecan chocolate pie tarte, and then beignets. Beignets are a traditional Cajun dessert so we decided there was no other option. 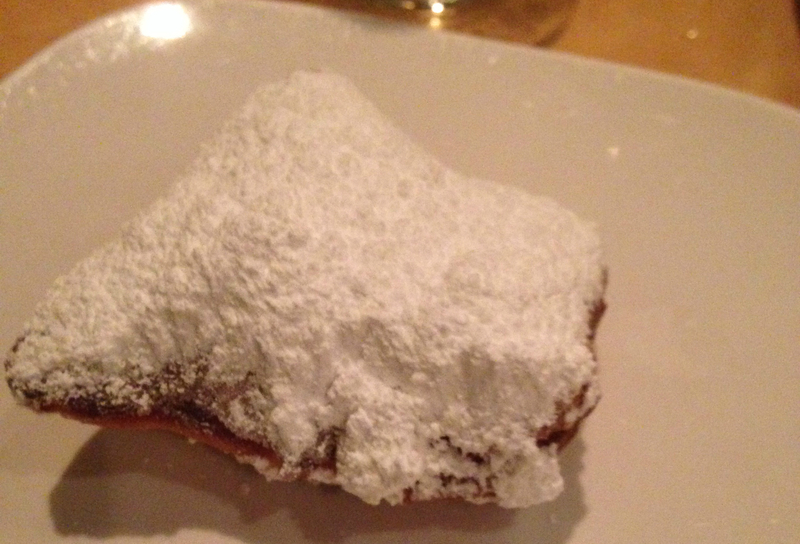 The beignets at Liliana’s are made with house-made brioche, fried and topped with powdered sugar. The beignets I’ve seen on TV are about the size of donut holes…these were basically the size of half a piece of bread. The order of three came with about an inch of powdered sugar on top. The powdered sugar made them kind of difficult to eat but totally worth it. They were super light and airy, and very flavorful! I’m definitely a fan of the beignet! The atmosphere was not what I was expecting. The bar was dark and intimate. The dining room was smaller than expected and decorated very simplistically. I was expecting a more elaborate dining room with big booths for some reason! There was a jazz ensemble playing the night we were there that really added to the atmosphere. Their website says they have music most nights of the week so make sure to plan your visit on a night with music! The oddest thing was a water fountain in the middle of the dining room that wasn’t running and seemed out of place.The outdoor patios look really nice and I love eating outside so I really want to go back when they are open. FOODNOTES: I know absolutely nothing about the authenticity of Cajun food but my jambalaya was very good. The flavor was amazing and the ingredients were very plentiful. I wasn’t the biggest fan of the red beans but the amount of vegetarian options was good to see. The corn bread and the beignets were the highlight of the meal! Both were exceptional and will probably bring me back to try other Cajun dishes! My favorite go-to place for lunch is Chipotle and the one I go to is in a small strip mall. The strip mall has a couple other places to eat but nothing great (a random Chinese place, Cousin subs and a coffee shop). There used to be a creepy seafood store/restaurant but it recently closed down and a pizza place opened up in it’s place. I’ve been waiting for another option in this strip mall and have been really excited to try Novanta, which dubs itself a Neapolitan pizza and mozzarella bar. The menu looked super promising and I read they bake the pizzas in big wood-burning oven! I finally got to go this week for lunch with a friend! I’ve heard the salads are really good but after looking at the menu I didn’t think they were worth it or could be better than any of the pizzas on the menu. I got the Caserta pizza with tomato sauce (they offer pizzas with an olive oil sauce as well), roasted peppers, roasted onions and salame. The pizzas come in one size, which is a little bigger than a personal pan pizza from Pizza Hut but the crust is thinner and a ton better. 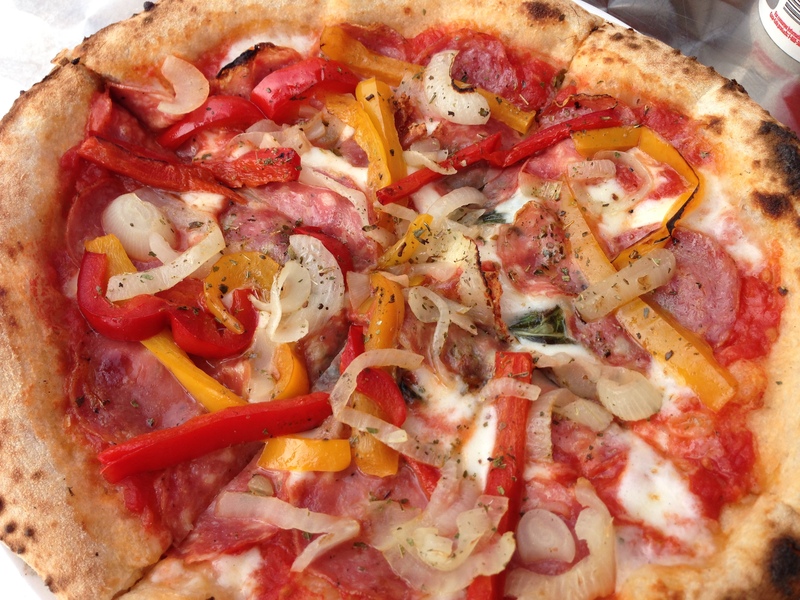 I loved the combo of toppings and the salame had a great flavor. I wish the roasted peppers and onions would have been chopped up into smaller pieces to make it easier to eat. I may be messier than the average diner but the huge pieces of peppers and onions kept falling off my pizza. The crust on the side of my pizza was perfectly charred and crunchy. The bottom crust was a little soggy. If it had been crunchier the large pieces of pepper and onions might not have fallen off the whole time! They do have a mozzarella bar with a house-made mozzarella and two options imported from Italy. They also offer add-ons like prosciutto, vinegar, olive oil, tomatoes, salame and ham. We didn’t try the mozzarella bar but definitely wanted to! 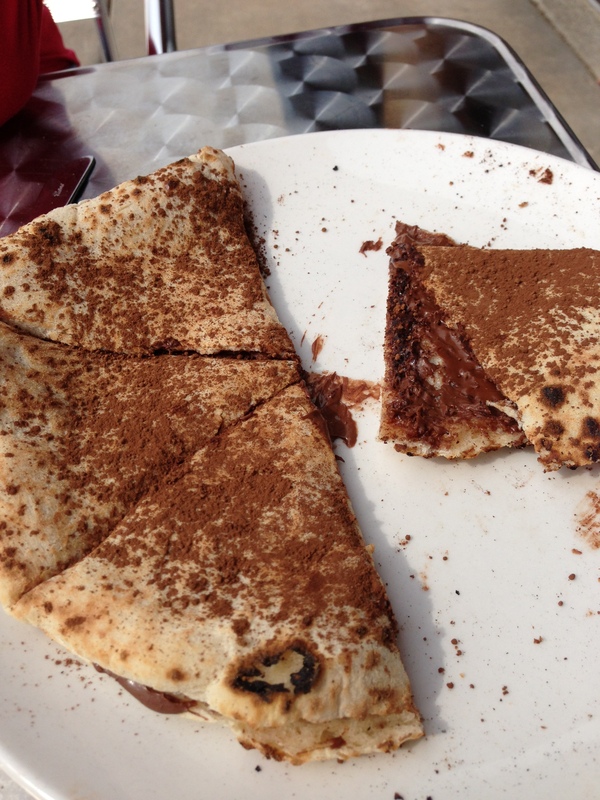 We decided to split the one thing on the dessert menu I’ve never seen before; a Nutella pizza. The menu says it is a pizza stuffed with Nutella, which is a completely accurate description. It is two thin pieces of pizza dough with gobs of Nutella in the middle. I had zero complaints about the pizza and will definitely be going back specifically for that. The pizza dough was great and balanced out the extremely sweet Nutella perfectly! We did have two small suggestions: offer whipped cream and raspberries or strawberries as toppings! The atmosphere feels like a college pizzeria with soda in cans, self-serve water in Coca-Cola cups and an industrial feel. It is super laid back and the staff was really nice! It did take a little while to get our pizzas but they are so fresh it was totally worth it. Just take note of that if you’re on a time limit at lunch. FOODNOTES: The pizza was fantastic but the crust could have been a little crunchier. I really want to go back for the mozzarella bar and include as many add-on options as possible! I will definitely be going back for the Nutella pizza and can see that becoming my go-to place for a great dessert! The prices were pretty decent for what we got but diners should take note the fresh pizzas take a little bit to be made (but it is totally worth it! ).